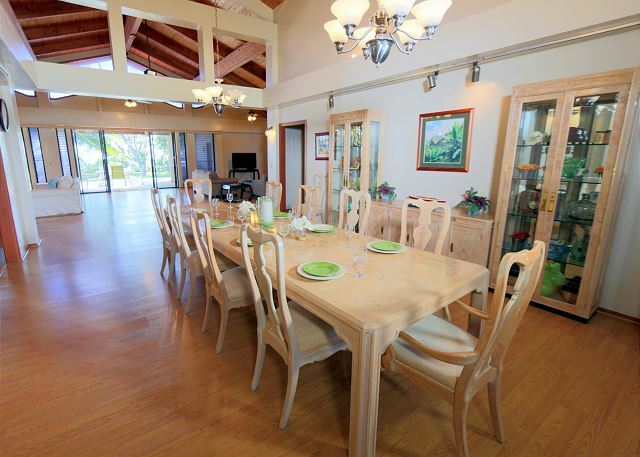 This spacious estate offers a private oasis in a convenient Honolulu location. 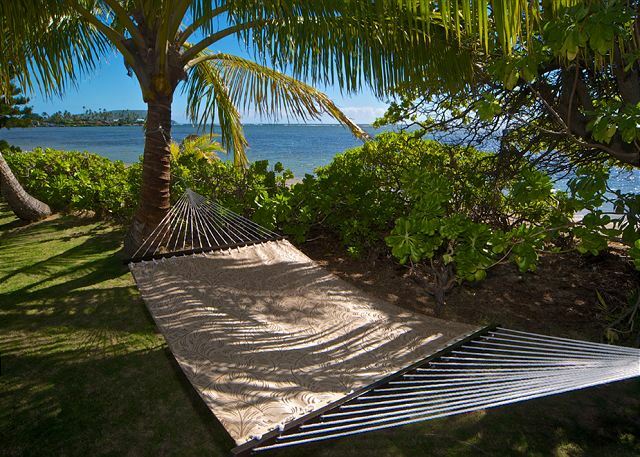 Spend your days lounging poolside, or relaxing in your ocean side hammock beneath swaying palms. 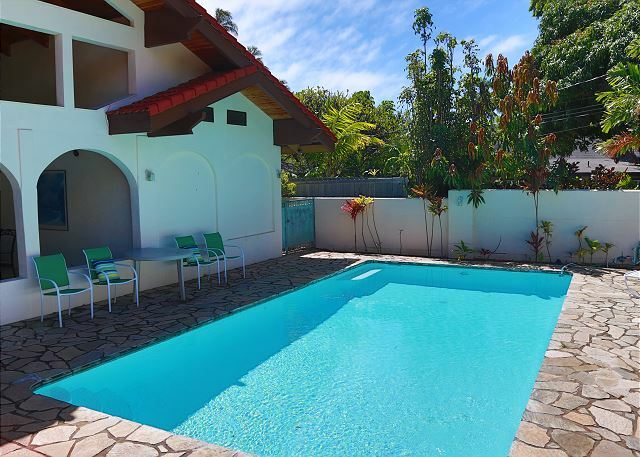 The Mango House has four bedrooms, two living rooms and formal dining for twelve. 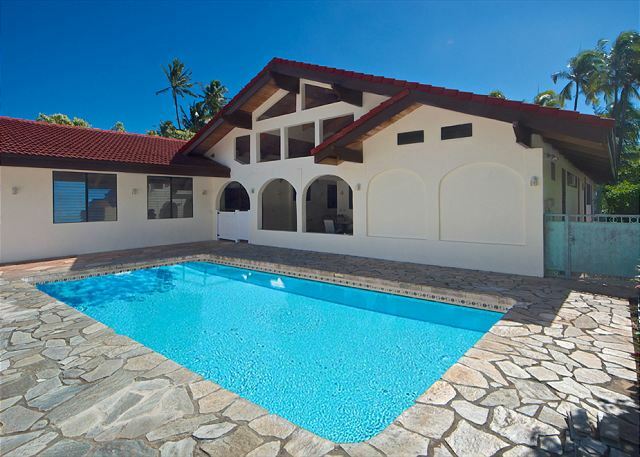 It is decorated in an upscale tropical style, and the vaulted ceilings and open floor plan afford fantastic ocean views throughout the house. The grounds are large, private, and secure. 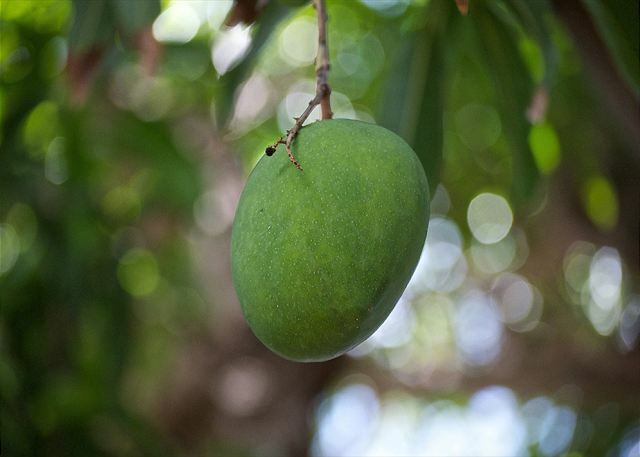 Mature fruit trees abound, including mango, mountain apple and pomelo. 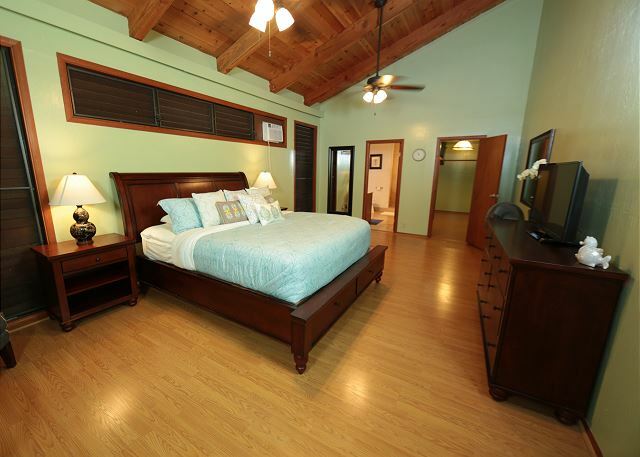 Other features include two covered lanais, game room, pool, laundry room, wi-fi, bbq, and a/c in all bedrooms. This is a private house; no other home, tenant or caretaker is on this property. The home sleeps a total of 14 guests, please see below for a detailed description of the bedrooms. The lawn spills down to a sandy beach with no crowds, it is accessible only by the few upscale homes located nearby. The water is calm and shallow, making it perfect for those with little ones in tow. Stand up boarding and kayaking are excellent here, and you may find yourself paddling alongside schools of fish, manta rays, sea turtles and even dolphins. To swim simply put on reef shoes and walk past the coral until you reach deep water. Fishing is great from the shallow coral area. The beach stretches for miles during low tide, and sunrise views are excellent. 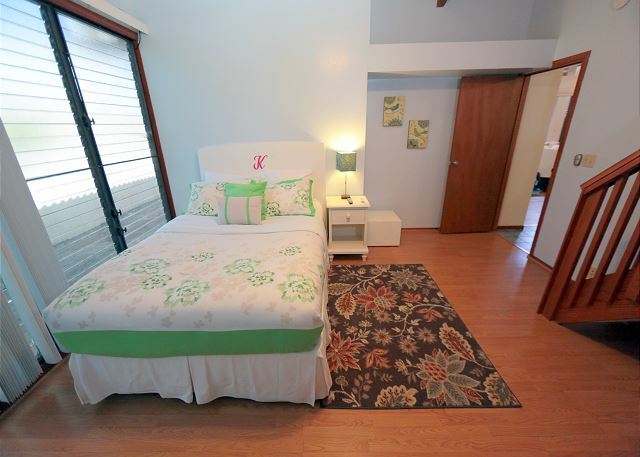 You will feel miles away from civilization, yet the best Honolulu has to offer is at your doorstep. 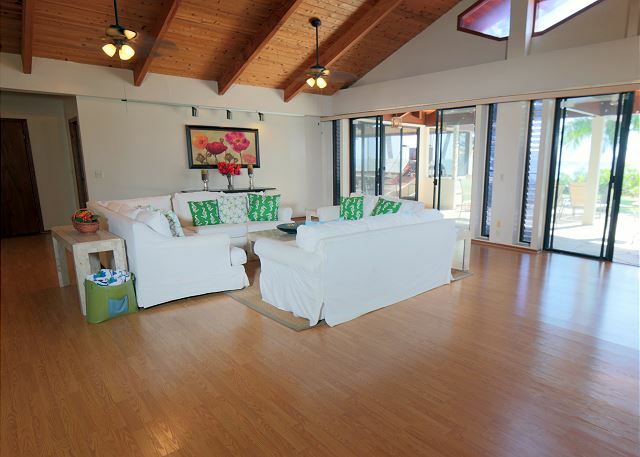 The home is located in an affluent part of Honolulu between Kahala and Aina Haina. It is very safe and family friendly. Nearby you will find plenty of grocery stores, including Whole Foods and Costco, drug stores, casual restaurants, upscale dining and boutiques. Diamond Head is 4 miles to the West , Haunama Bay is 4 miles to the East. 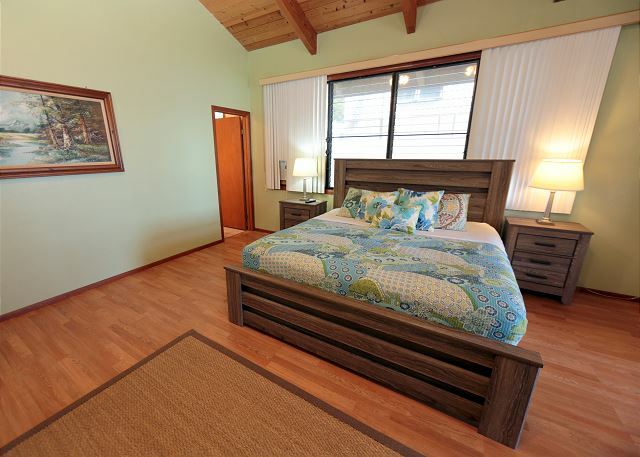 Nearby activities include snorkeling, hiking, parasailing, jet skiing, hang gliding, and golfing. The home is located close to major highway access so is a convenient starting point for day trips. Waikiki is 4 miles away, the airport is 12 miles, and Pearl Harbor 29. FAQ'S : For details about check in/out, cancellation policies, etc. please click "Policies" tab above. This was a great location fo our purposes. An active family celebrating a 50th wedding anniversary and a march birthday. A very spacious home that gave everyone space and outstanding views. The noise from the highway was the only drawback, but that faded as time went on. The pool was delightful and entertained our twin 8 year old granddaughters. The home was well appointed with just a few drawbacks. We felt that the kitchen could have had a LARGE Fry pan for a large group of people. The 4th bedroom mattresses were a bit too soft and the Master bath shower head needed repair. However all worked. When we arrived, I recieved an email from the managers asking if everything was ok. I emaild them back that the pool needed some serious cleaning. within 4 hours we had 3 different people show to take care of the problem. All of them were very polite and concerned. Check out was outstanding with the emails with of what they required of us and what they would assist us with. My wife of 50 years and I were totally satisfied that we made the correct choice of locations for our celebration. Mango Hale was an awesome place for my family of 10 adults and 2 little ones. The location was great for watching the sunrises on the beach and nice calm water for the children to enjoy. 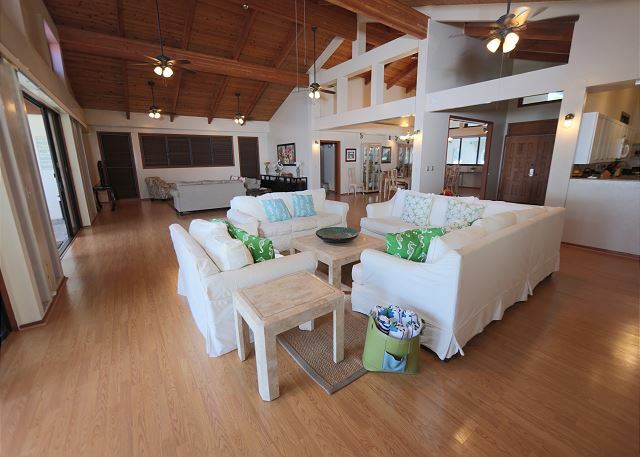 The house had a tropical feel with huge open spaces...plenty of room for everyone. The home was very clean and yard and pool were great although some wear and tear issues because the house is older...like the gutters pouring onto the patio when it rained. Sara and Lani were friendly and helpful. My family is already asking when we are going back! A small group of us came to Oahu for a work conference. The Mango Hale allowed us to spend lots of time together without being too close. 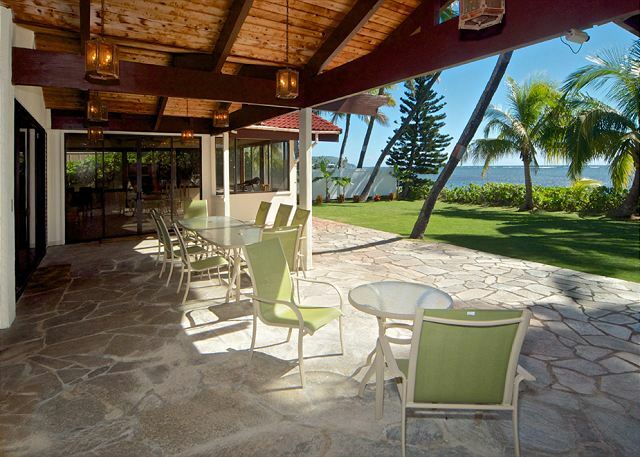 We had plenty of room and enjoyed the gorgeous sunrises and evenings on the lanai. I would recommend the Mango Hale to anyone, especially families or bigger groups. Manager Response: Thank you for taking the time to review, Julie. It is our goal to make the home as comfortable as possible for large groups, we are so happy to learn that you were all happy here. Mahalo for staying with us! Amazing House - Great Location! This was a fantastic house. Huge — lots of space for a big family or several families. Well equipped with all the comforts of home. It was so nice to have a quiet beach front property. The Management Company was non-intrusive and helpful when needed. The location is perfect. Outside of the monstorous traffic of downtown Honolulu but close enough to major roads to get anywhere on the island. Yes, it’s right off a major road, but once you figure it out, it’s not a big issue. It’s far back from the road so you don’t hear any noise. There’s grocery stores right down the way so you can buy more paper towels if one isn’t enough. The pool was too cold to swim in in January for us but it was pretty. Great amount of lights and fans. Master shower is super nice — the other showers are a bit cramped, but get the job done. 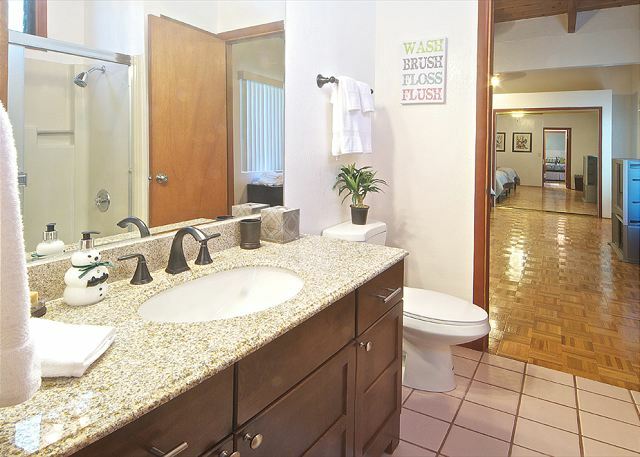 Ample bathroom space. We very much enjoyed our stay! This house is beautiful!! 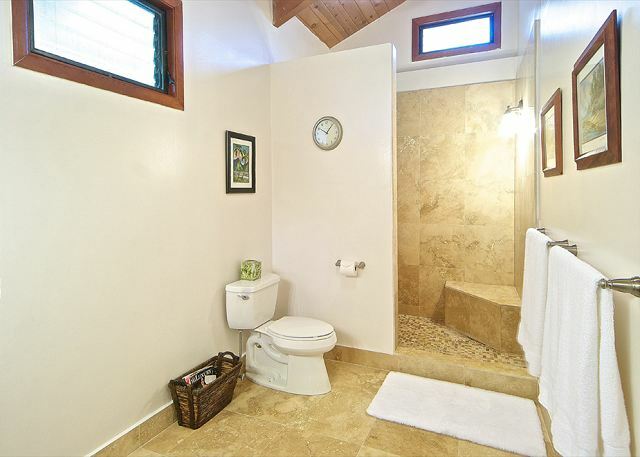 Plenty of room for everyone with lots of privacy!!! 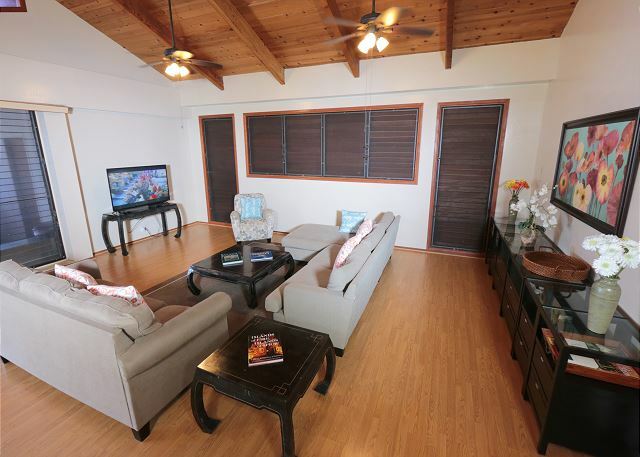 Convenient location to Honolulu and local attractions! Do yourself a favor and rent this house, a jeep, take the top off and explore the island! Perfect house for a perfect vacation! We had amazing time visiting Hawaii and staying at the Mango Hale! The house met all our expectations. We were a family of 12 and there was plenty of room for all of us to relax. The location can’t be beat. Any minor issues we had were quickly handled by the owner. 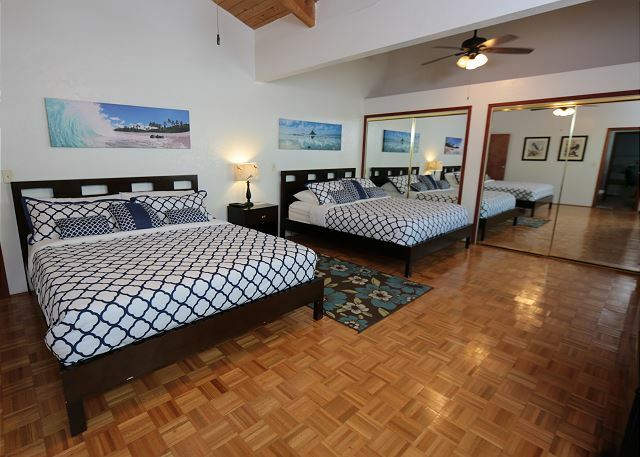 We recommend the house to local Hawaiian friends with a wedding and honeymoon coming up, for a space for out oof towners. Hoping to be back again the future! Mahalo! 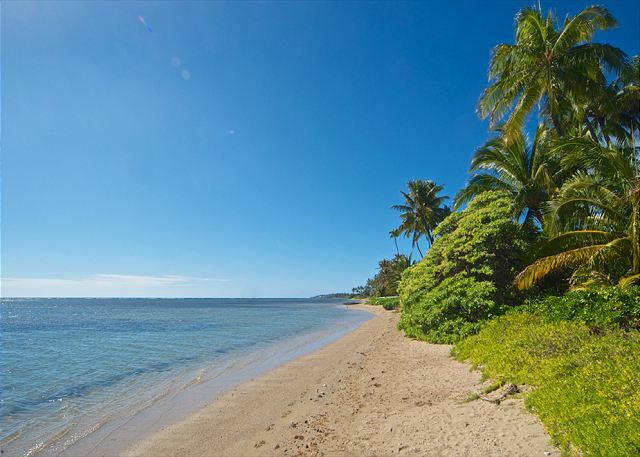 Beautiful property situated with a magnificent view of the ocean, especially the sunrises! We had plenty of space inside and out for our large family group. The location is great for getting around the island. We were completely pleased and an excellent experience! We just arrived home from our 5 night stay at Mango Hale. 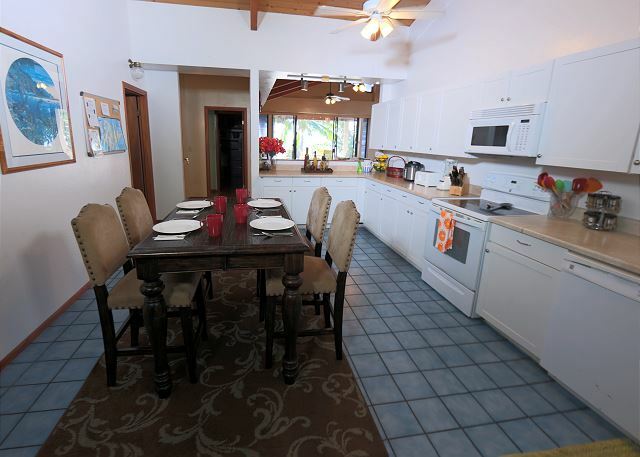 This property was perfect for our family of 8 adults, three children 5 and under and an infant. I can't say enough good things. The home is very spacious and very functional. We enjoyed bbqs in the backyard every evening so we could enjoy the beautiful view and coffee in the mornings doing the same. We all loved the pool for late afternoons. The beach felt like we had our own private island. Water shoes are a good idea as it is a little rocky but once past that it is perfect. Water is pretty shallow so perfect the kids to play! The property was very clean and stocked for our needs. We had one small issue when we arrived on Saturday afternoon. I called the management company and they sent someone right away to take care of problem. He was very courteous and professional. 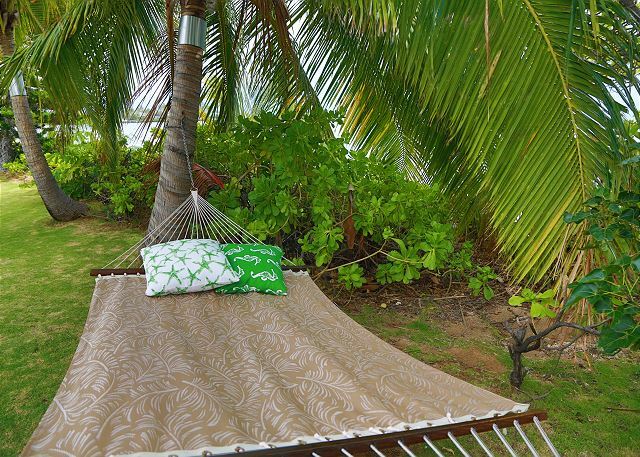 I also mentioned that the hammock was missing that I so looked forward to laying in since I saw it on the picture. 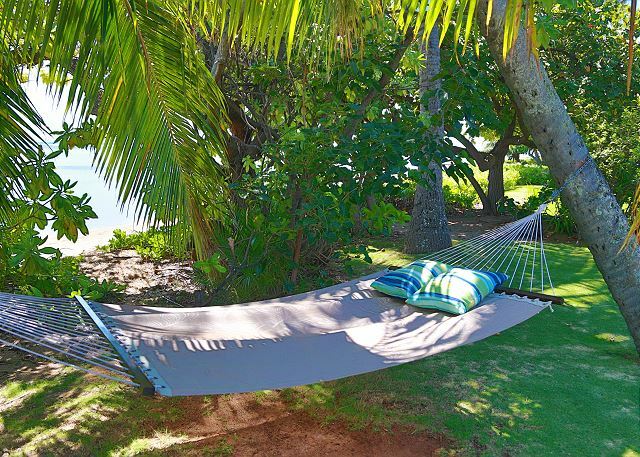 The very next day a new hammock was put up! We all said that we will be back to Mango Hale again one day! We were there for family reunion, and it was a wonderful experience at Mango Hale. Location was perfect! Kids loved the pool, backyard and the game room. 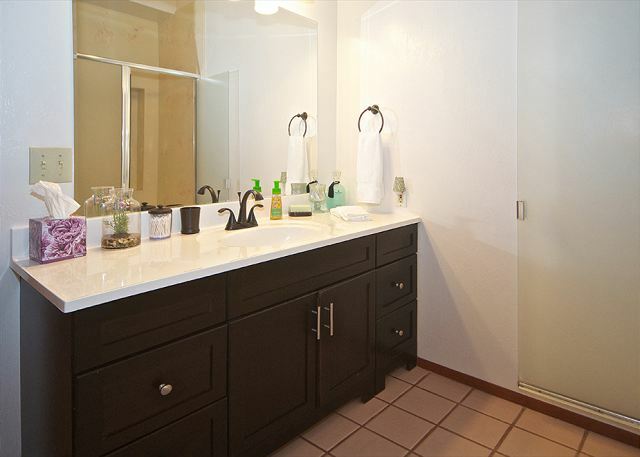 Adults enjoyed outside patio and beautiful spacious rooms. It was clean and maintained professionally. Email and phone follow up was very quick. We were very happy that we chose this place. The descriptions of the property is accurate. We would love to come back again! 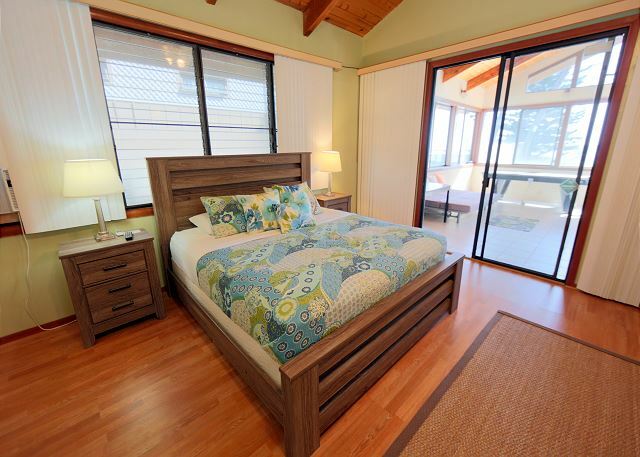 Best place to stay on Oahu! 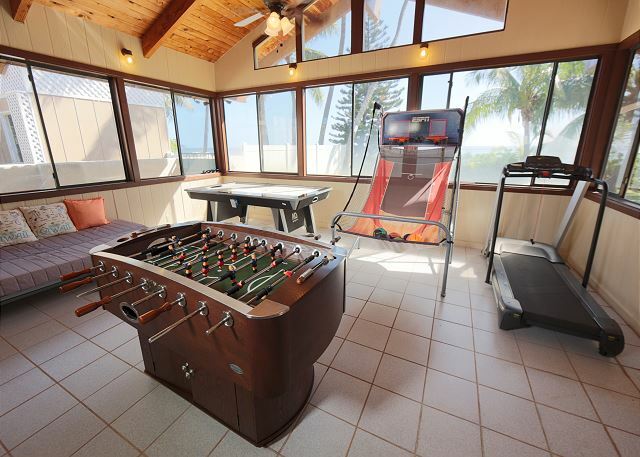 This vacation rental definitely exceeded our expectations! This beautiful, clean, well-maintained home was well-stocked with everything needed for food preparation and included TWO washers and dryers (which was appreciated for our family of 7 people)! 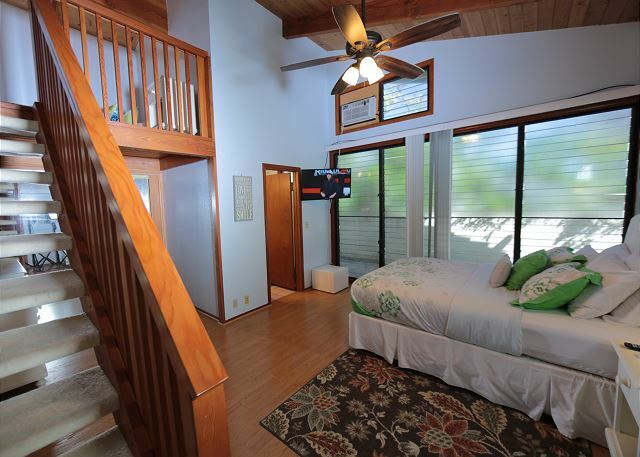 The bedrooms, bathrooms and living areas were huge and the lanai had more than enough room for us to eat and relax. A huge gourmet gas grill and attractive private pool made outdoor relaxation the best. 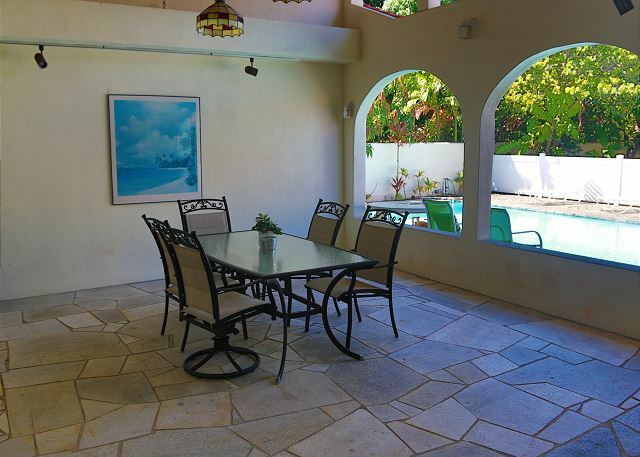 The property was safely gated and the landscaping was beautiful and well-maintained. The only drawbacks were a lack of washcloths (only 2 for 7 people) and at least one of the bedroom TV's did not function with the remote. Overall, a wonderful vacation experience!